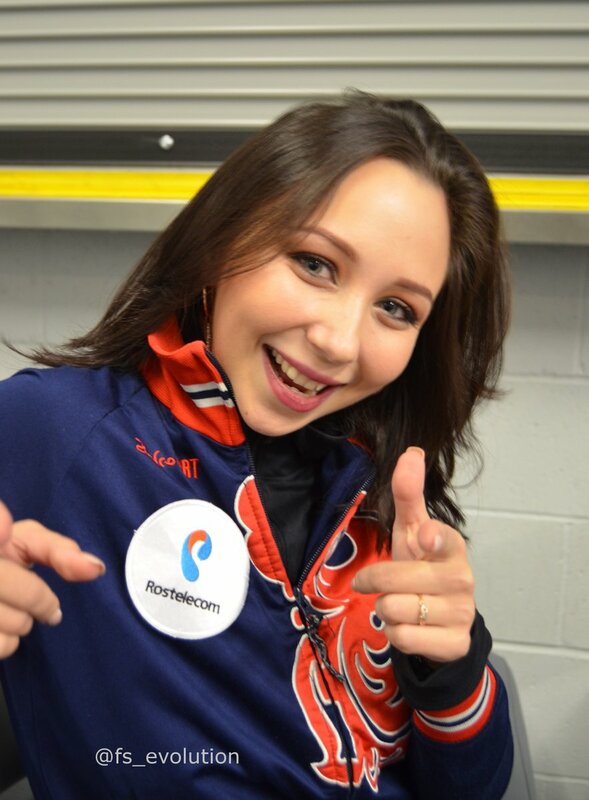 Elizaveta “Liza” Tuktamysheva is off to a great start for 2018-2019 season. After failing to make the Russian Olympic team for the 2018 PyeongChang games, the 21-year-old has won both her International Skating Union (ISU) Challenger events–Lombardia Trophy and Finlandia Trophy, and then mostly recently won Skate Canada International, her first Grand Prix event of the season and her first Grand Prix win since the 2014-2015 Grand Prix Season. This weekend, the 2015 World Champion will attempt to qualify for next month’s Grand Prix Final at her second Grand Prix event, NHK Trophy in Hiroshima, Japan. If she qualifies, it will be the first time she has competed at the Final since she won the title in 2014-15 season. That season was also following the 2014 Olympics, in which Tuktamysheva did not qualify for. At Skate Canada International Oct. 27, Figure Skaters Online’s Francesca S. sat down with Tuktamysheva briefly to talk about this new quadrennial, the new scoring system, her programs for this season and her new venture, Twitter! Figure Skaters Online (FSO): You are back in top shape after struggling the past few seasons (including last season where you failed to make the Olympic team for Russia). What has changed this season? Is it a new way of training, or is the mindset? Elizaveta Tuktamysheva (ET): It’s more mental. It’s more important for me than my physical condition. After the Olympics, with a new scoring system, I feel in a new way that I can compete with the other girls and when I feel like that, then I improve my training. FSO: You mentioned the new scoring system–what do you think of the new scoring system? Do you think a skater like you, with big and clear jumps, will have an advantage? ET: I think so, but not like today (after Skate Canada ladies free skate) because my jumps were not great as I was nervous, but if I skate like in training and improve my triple axel and triple lutz-triple toe combination, I think I’ll have good results. FSO: What is a typical day of training like for you? ET: I wake up, get breakfast, go to the rink, then after the first training, we have 1-1.5 hour of break. Then after the second training, we do other things. Then around 6-7 p.m., I go home and rest. Off-ice, we do muscle work, warm-up, some exercises for jumps, or we work on the choreography because that improves it on the ice. FSO: Tell us about your programs this season. The short, a tango, gives a mature and strong image, while your free skate is more playful. Which one is the “real” Liza? ET: Actually, both of them! Sometimes, I’m really strong, but more often I’m funny and flirty like the free skate. But when I go to a competition, I’m more like the short program. FSO: Your costumes have a very specific style. Who chooses and designs them? ET: I really like my free dress this year. I love my body and I can show it. I have been working with the same designer, Maxim (Sokolov), for about 10 years. He’s so creative and he wants to do stylish fashionable dresses that don’t look like figure skating dresses. FSO: Do you have any role modes in figure skating? And who do you admire outside skating? ET: In skating, I have a few people that I like how they skate, but if you want to be a winner and a good sportsman, you can’t admire too much someone else. Outside skating, my favorite actor is James McAvoy. I like his energy and passion. FSO: What do you do you in your free time? ET: Watch movies or TV series, go to restaurants, spend time with my boyfriend. Do things like normal people. FSO: You joined Twitter in August, and you are not afraid to speak your mind about skating and other things. What made you start being so involved, and to strongly speak your opinions? ET: I just wanted to be able to connect with the North American people because I consider Instagram more for Russians and Twitter more for Canadians or Americans. It’s Twitter, if you have it I believe you should say what you really think. I don’t say bad things. I just say what I think, but in a fun way with humor.